Previously it’s been mentioned in the news that Starbucks would soon be ending customer service functions in Seattle. For those who wonder what I mean, when customers call or email Starbucks with a comment or complaint, previously a representative in Seattle, located inside the headquarters, fielded this function and responded to the customer. The New Mexico call center goes live on September 23, 2010. From that point on, all calls are handled in New Mexico except if “escalated” to Seattle. Escalation means that there is a problem or concern that requires the attention of a Seattle partner. The customer service representatives in New Mexico work for a third party call service center and are not partners. I want to back up a minute and talk about the place where Starbucks came from in terms of Customer Service. I can remember well over a decade ago, standing in my local Starbucks and picking up a customer service feedback form that said, “We’d love to hear your thoughts.” I picked it up and wrote down that I would prefer to hear different music. Probably, knowing me, I suggested more Tori Amos on the playlist. Not too much later, in the mail came a free drink coupon thanking me for writing to them. I was surprised. All I did was ask for different music. It wasn’t a complaint. ^ Okay, that link is the highlight of this blog post. It’s brilliance. I’ve been worried that Starbucks Customer Service would lose its magic touch in the shift. We all know the experience of calling a customer service representative, and speaking with someone who knows less about a corporation than the customer. I also suspect there’s been some confusion in the transition from Seattle to New Mexico. A twitter friend told me that she had written (via the email link) to Starbucks about not getting bold, and didn’t get any response. One quick tweet to the official Starbucks twitter account seemed to fix that. 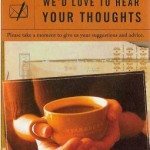 I suspect that other resources such as MyStarbucksIdea.com and twitter can perhaps help fill in holes in the Customer Service experience. Only time will tell if the change is a good one. Yes, I’m worried a little. Just because you can cut costs in a particular area doesn’t mean you should. Melody, I am really sorry to hear that SB is moving their customer service to New Mexico and to a third party group. I have had such problems with one particular company (which will go nameless) that has done that and I fear the same thing will happen here. SB already has issues with customer service not only on the corporate level but the store level and then they decide to move the CS dept??? Purely for economics? I love your story about getting the free coupon. I had a hard time with the volume to the link for Ferrara story. I wish SB would reconsider, but I know that will not happen. I have complained a while ago about a very rude partner at a German store. He was really rude and totally didn’t in the Starbucks concept. So my complain really was justifiable. That was it…no coupon, no free drink…I was very upset. I think the reaction you got is much more typical American….good customer service. Thanks so much for helping me Melody (the power of twitter is must stronger that I ever imagined when I joined last year). Apparently they will be sending me a free drink coupon as well. I really wasn’t so mad because I live in Boston and could just walk an extra block or two and go to another Starbucks who could give me what I asked. I was told they will be talking to that specific store so I’m happy. That really is too bad that they will be moving their CS. I will admit I do love mystarbucksidea.com. It’s a great outlet to give ideas to better Starbucks and it allows all customers at Starbucks the ability to voice their opinion. I cannot recall anytime when outsourced customer service (CS) has worked out well for The Company or The Customer. The bean counters (in this case I am refering to corperate accounts) can produce some pretty fancy charts and “metrics” that baffle and amaze The Company management into thinking they made a good decision. The reality is that The Company loses its direct link to The Customer. The outsource CS company has no incentive to escalate problems. By the time The Company realizes it has lost touch with The Customer it is too late, and if recovery is possible it becomes very expensive and takes a long time. This move by Starbucks indicates to me that they really do not appreciate their customers. But I am not surprised since Starbucks outaourced their maintenance. Have you noticed how well that is working out? @Amy – I suspect that your email to customer service at first got lost in the shuffle – Probably people are literally cleaning out their desks, and so right now customer service isn’t that great. The brand is ICONIC and their Customer Service reps have to know sooooo much. I worry. I’m still missing a ton of rewards coupons. I’ve earned over 1,100 stars so far, and there is no way that I’ve gotten anywhere close to 73 free drink coupons. Not even close. At best I’ve gotten about half of that. And I was rolled into the program at the gold level because I had the previous black card, so all those stars should count for free drinks. I might call Customer Service tomorrow morning – first day of the New Mexico non-partner Starbucks reps – and I’ll be curious what they say to that. I would be curious of what they say Melody. I really wish they would email the free drink coupons instead. I don’t think I have gotten anywhere near the amount that I should have. I actually get them more frequently than my husband who also has a gold card. You are completely right- they do have to know a lot. They should have different CS reps with different specialties- just my two cents though. When the new fraps came out, I emailed the CS because I was told from a Starbucks barista that all the new fraps (with the exception of any made with chocolate) if made with soy milk were nondairy. Well after gettign sick (I’m very lactose intolerant), I emailed them and basically it took me sending five different emails to the same customer service rep for her to answer my question. It turns out there is a milk product in the coffee light frapp. I really think it’s a lot for them to expect to know. I think it’s a shame to outsource customer service to a third party. In my experience, talking to a third party about a company they don’t work for is pretty useless. And (again in my personal experience) they aren’t particularly polite. They also seem to have very little power when it comes to actually helping; since they’re third party and all. Overall, I think it’s a poor move. It’s hard to feel like contacting customer service will be helpful when you already know the people you’ll be talking to don’t even work for the company in question. I have to agree with all the sentiments stated already…it’s far less personal and people fall through the cracks. For a company who touts what they do…it’s a bad move. Legendary will be lost in the mix. My late Mother told me once “things are getting worser and worser”. She was I think referring to Watergate but that statement can apply to just about everything now a days especially the horse puckie of Starbucks turning their customer service over to a third party that knows or cares nothing about Starbucks or their customers and will, I am afraid alienate quite a few customers and in New Mexico of all places. What were those idiots at Starbucks thinking of anyway? Where next? To India? I think Starbucks is acting pretty irresponsible at sort of penny wise and pound foolish. another big long sigh from @GAStarbucksGirl :-/ I hate to see this happen. The company is just so big now. It’s certainly not what it was. It’s not the company I so romantically dreamed of working for and I wonder if it’s what Howard Schultz ever dreamed it would be. Somehow I think he would have like it to stay small and intimate, personal and one-on-one. But how could it? Well at least we Americans might be able to understand a person from New Mexico. You would certainly hope so anyway. I agree with what DadCooks said, I don’t think it will be good. (it’s bad enough with tech. places…..those tech support computer calls….yikes!) BUT, on the other hand, as GAStarbucks…. pointed out: at least (we assume) they will be speaking English and we can understand them. then again, maybe not. I’d be very curious to know how the location in NEW MEXICO was chosen. and why. First, please excuse my spelling errors in my first post today: corperate accounts should have been corporate accountants and outaourced should have been outsourced. I had just washed my hands and my fingers got soap in their eyes 😆 😉 . New Mexico has become home to many call centers. If you Google “New Mexico Call Centers” you will get a lot of results. If you look at who they are hiring, there is a preference for multi-lingual, not a whole lot of emphasis on knowledge of what they are answering calls for. A selling point of call centers is that they promise 24/7/365 coverage. They also promise to control costs of support. Translation: we are here to serve the company, not the customer of the company–to the call center the company is the customer. Call center slaves employees are subjected to ambitious goals of large number of calls/emails answered per hour, low number of calls/emails escalated, and least amount of “giveaways/refunds”. Just because a call center is located in a State does not mean all the calls/emails will stay here in the USofA. Almost all call centers have offices around the world. That is how they can offer 24/7/365 service without incurring a lot of “premium” time (swing, graveyard, and holiday shifts). I patronize my favorite Starbucks not because it is a Starbucks but because of its legendary service. Starbucks has lost some of my business because of the discontinuance of the 10% original black/goldcard. As Starbucks Corporate Policies continue to erode the ability of my favorite store to deliver legendary service I will search for a coffee company that respects me as a customer. I think outsourcing customer service with a company of Starbucks’ age and size is a HUGE mistake but it just seems to fit with the decisions they have been making in the past few years. Many of those decisions have been money and bottom line motivated and this one is no different. But like you said time will tell. For the last few years, “Customer Service” appears to have been seen as a “cost” item for Starbucks that they have been needing to reduce and reduce. The return policy was changed a couple of years ago, and now the outsourcing of the service group. The only time I ever used Starbucks’ Customer Service was when my Saeco Digital Italia espresso machine broke within two weeks of purchase. I had no real expectations, but simply wanted my machine fixed. Starbucks Customer Support went above and beyond my expectations and provided truly “legendary” service. That was a very endearing moment to me and cemented my loyalty to the Siren. I honestly do not expect the same level of service from an outsourced company and that is quite sad for the Siren’s brand. At some point, I hope Howard will look no further than Seattle’s own Nordstrom to see how things should be done. Denise made a reference to tech support centers. I once called a Microsoft support center and it was in…you guessed it…India. I forget now what my problem was but I remember I made the comment “it’s about as slow as watching paint dry” a phrase that everyone knows or so I thought. He had absolutely no clue what I was talking about. Bottom line outsourcing customer service is a very bad idea and not really too good for a company’s image. I believe Starbucks, in an effort to save a few bucks, has made a terrible mistake but as DadCooks so eloquently said “corporate accountants can produce some pretty fancy charts and “metrics” that baffle and amaze The Company management into thinking they made a good decision”. Customer service only in outsourcing is not good, but Starbucks will not have an essential lack of communication because Starbucks has various society media to maintain communicating with customer, I think. Also, there is the excellent website such as http://www.starbucksmelody.com connecting Starbucks with Starbucks customer in U.S. These are the communication that can improve Starbucks and that may improve the method of the customer service. Probably you can not believe that. As for Starbucks coffee Japan Ltd, nothing has the social media to communicate with the customers. There is not it at all. I asked the customer service of the headquarters, but they said that Starbucks coffee Japan did not have a plan of the social media. In addition, they do not have even the answer about the reason. The product offer that does not share information with a customer seems to be a vending machine. I want Starbucks Japan to start the social media site to maintain the brand that it is loved by customers. Yes, we all know how well the out-sourcing of the equipment techs went. Now instead of making maybe one or two phone calls, you have to go through nearly nine different people to even get an estimate when the equipment might be even looked at . For example, one of the techs comes quite often into my Starbucks and our grinder broke. He was sitting right there in the cafe and couldn’t look at it. He said there was NOTHING he could do accept say to use “common sense” and turn it on and off and reset the button. Other than that he would respond back in 96 hours when FSN has called him in. Well, thankfully it worked. I thought one of the best things at Starbucks is focusing on you CAN do to fix a situation . Based on all the negative responses to SB’s move of the customer service dept to a third party group and to New Mexico, I sort of am hoping they will reconsider although I know given the situation that certainly will not happen. I fear it will be too late once it starts when SB realizes what they are losing in terms of customer base, alliegance, etc. As others have said and also I said I really think SB is not thinking about the customer. I am reading a book now that just came out last weekend: “Marshall Field’s The store that helped build Chicago” by Gayle Soucek. Every single second that I read it I think: this should be required reading for ANY business, person going into business, retail , customer service etc. Shcultz should be reading this. Of course, we lost our beloved Field’s when Macy’s took ove some 400+ stores all over the country in 2006 (not just Field’s) and changed them all into Macy’s, which have since become like slums compared to Field’s. It was good for all the Nordstrom stores here…they got the Field customers, mostly. Except as wonderful and similar as Nordtrom is, they don’t have housewares, etc. and really, not a quater as ‘much’ as Field’s. BUT, they have wonderful customer service. And THAT was the essence of Marshall Field and what he built…..hence the phrase “give the lady what she wants”. This is a paperback book and easy, interesting reading. I urge anyone interested in quality in service and retail to read this. It’s quite amazing. 1. – 20 years ago I worked for Wal-Mart when Mr. Sam Walton was still alive. The company that Mr. Sam created was a wonderful place to work for. The corporate philosophy was about providing a product and service that met the expectations of their customers. If customers weren’t happy, Mr. Sam wasn’t happy. The two prevailing ideas at the time were that all products were made in the USA and the customer is ALWAYS right.. no exceptions. I left Wal-Mart after 4 years and moved into my career of choice. 6 years ago, I found myself between jobs and went back to my beloved Wal-Mart. Every aspect of the philosophy that Mr. Sam created is gone. The change between the company and product I once loved and the mega-corporation it has turned into is so dramatic, my husband and I have boycotted Wal-Mart all together. Knowing what that company once stood for breaks my heart. 2 – During that same time between jobs, I went on an interview at a local Call Center. The interview consisted of hearing what the caller was saying, picking out key words, and repeating back to the caller what appeared on the screen in response to the key words. I couldn’t tell you what the product was nor did I need to know what the product was. No free thought, no common sense, and no customer service skills are required. The only requirement is being able to read outloud. Needless to say I didn’t accept that job. So this is what scares me about Starbucks moving their Customer Service to a third party call center. Is this a sign that Starbucks is moving away from a product and customer based philosophy to one more concerned about the bottom line and how many stores they can produce? Thankfully we have some great stores here in TN with some knowledgeable Black Aprons that can answer most questions we have. When I walk into a store, I know what I want and I expect the barista to be able to make my drink the way I like it. And more times than not, that’s what I get. If I ever find the need to call Customer Service, I expect the Customer Service rep to have just as much knowledge as the Black Apron in the store. Moving to a third party to handle Customer Service makes me wonder if Starbucks is going to be one more product that I dearly love that I will have to say goodbye to. This makes me sad. This is a dreadful decision…and as for the unanswered Customer Service emails, I have one in that forgotten queue from about a month ago. It used to be you had an email replied within 24-hours…but now, silence. @deniser As for Nordstrom family, during my time in Seattle in the 80s, I had the chance to meet a a couple of them. Big supporters of the UW Rowing program. I have heard many stories of when the sons were attending UW, their first job in the company was selling shoes in the flagship store. Yes Karl Starbucks’ decision to outsource their customer service just to save a few bucks is a dreadful decision, one that I think Starbucks will eventually regret. As for not answering e-mails yes I think it is pretty rude for anyone easpecially a company that is supposed to have good customer service. I agree poeple can be busy but it is really rude, not to mention inconsiderate, to not answer an e-mail within 3 or 4 days and one week at the most. Actually how much effort is it to answer an e-mail? You don’t write it on paper so you don’t need good penmanship, everything is typed so you know the reciepient can’t say they couldn’t read your hand writing, you don’t need a stamp, and your e-mail is delviered instantly. Lastly Nordstroms is the epotimy of good customer service and I doubt if they will ever stoop low enough as to outsource something a valuable as customer service. I have never had the occasion to call Nordstoms but I doubt very seriously if they have a voice mail hell like so many businesses have. I just had my first opportunity to call Starbucks Customer Care. Case number 3607274 – They dont have the ability to email you the case number if you call by phone. The customer service rep seemed okay. All she did was offer me free drink coupons and told me that they’d send free drink coupons and contact the SM and DM. I firmly told her I don’t want free drink coupons. I’ll probably follow up myself too. Interesting experience Melody. I really wonder what your experience will mean for the whole process and how SB will change their approach if at all. Why did you call? I actually work for the Customer Service Center in New Mexico. All of us have gone through extensive training to assist Starbucks customers. We take pride in the customer service we provide. 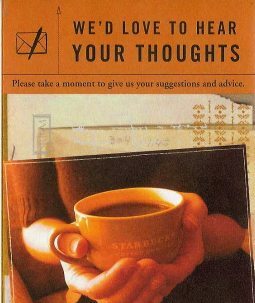 You can call or E-mail your questions or concerns & will be responded to with the upmost respect that we want our Starbucks customers to have. @anon: I’m glad you take pride in your job etc. But I think there’s only so much that one can be ‘trained’…..it helps alot if one already KNOWS the stuff. I think that’s part of the problem with being off site (in other situations) and, in Sbux case, out of town. Melody, I didn’t know SBUX outsourced this aspect of their business but I have called them and emailed several times in the past two years and have always received a prompt response with no noticeable loss or downgrading of their famous customer service. I think SBUX is one of the few companies including Lands End and Lands End Canvas that does customer service RIGHT whether it is on a local store level or if you have a bigger issue that requires a phone call or email to explain. I have even emailed DMs and they respond promptly also. @denise – I completely agree with you! Extensive Training is not the same as Extensive Experience!